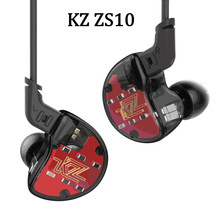 ℹ The KZ ZS4 has just been revealed with further information about their technical specifications and an official photo, following to the insane amount of new KZ earphones announced and released this month, like the recently available KZ ZS10 and KZ ED15, both being the only two models that can be purchased at this moment. From the only image available, the KZ ZS4 seems to have the exact same housing of the KZ ZS3 but it could also be shaped similar to the KZ ZSR (which many got confused and thought to have the same housings of the KZ ZS3). The KZ ZS4 also have the same shared bi-pin cable connector (and detachable cable) that will be compatible with KZ Bluetooth cables and KZ upgraded cables but will have one big difference, the KZ ZS4 will be an hybrid in-ear headphone with 1 balanced armature + 1 dynamic driver. The housings will be constructed in polycarbonate and we are hoping that they inherit the housings of the KZ ZS3 instead of the KZ ZSR, as we have found the KZ ZS3 ergonomics to be outstanding.